This was a really healthy and really fine-tasting (make that addicting) salad. I subbed soy mozzarella for the real stuff. Turn on broiler. Brush zucchini with 1 tablespoon oil, sprinkle with salt and pepper, and broil, turning as needed, until lightly charred on both sides and beginning to soften, 5 minutes or longer. Remove and cool, then cut zucchini into chunks or slices. 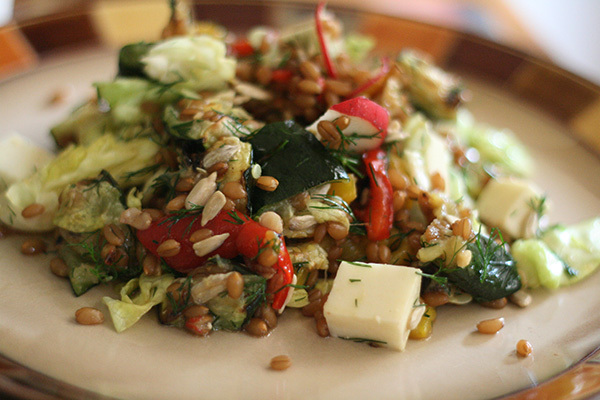 Toss together the zucchini, wheatberries, roasted red peppers, radishes, lettuce, and dill in a large salad bowl. Add the vinegar and remaining oil. Sprinkle with salt and pepper and toss again. Taste and adjust seasoning. Toss with mozzarella. Makes about 4 servings. Another great summer salad. The original called for goat cheese, which I am quite sure must have tasted delicious. Instead, to make this nondairy, I grated some soy mozzarella before tossing. 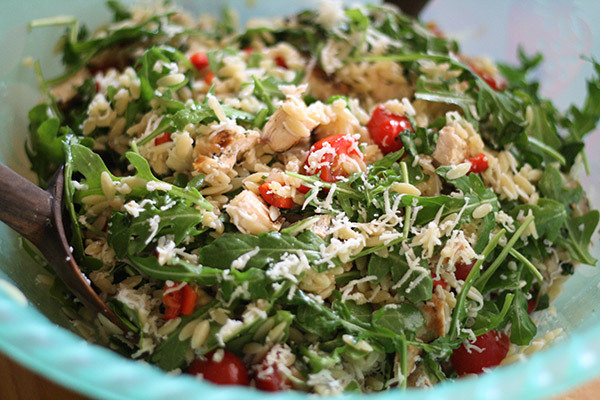 There was a lot of salad left over for lunch the next day (this recipe is enough for 8 servings) – still fresh tasting and the orzo added the right chewiness. Combine pasta, chicken, and the next 5 ingredients (through oregano) in a large bowl; toss well. Combine vinegar, oil, salt, and black pepper in a small bowl, stirring with a whisk. Drizzle vinegar mixture over pasta and toss well to coat. Sprinkle with cheese. 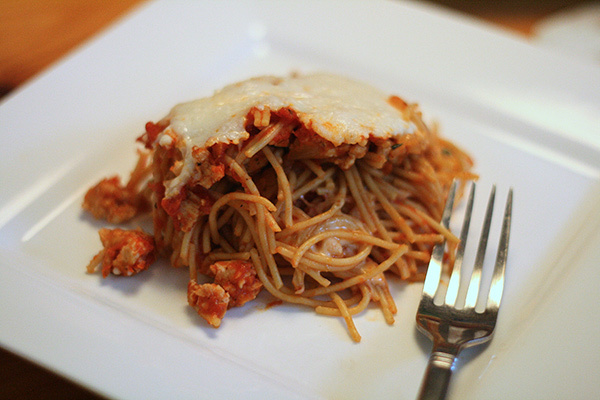 I made this in the summer, but I really missed having a pasta meal with red gravy. This was easily adaptable to use nondairy cheeses. It was great. Preheat oven to 350 degrees F. Cook pasta in boiling water for 7 minutes instead of 10, as it will be going into the oven. Drain. Heat a skillet on medium heat and add olive oil. Add onions with a sprinkle of salt and pepper and saute until soft, about 5 – 6 minutes. Add garlic and stir for another minute. Season ground turkey with rest of salt and pepper and add to skillet. Break apart with a wooden spoon and brown on both sides, about 5 minutes. Stir in 1 cup of pasta sauce and half of the chopped fresh basil. Mix to combine. 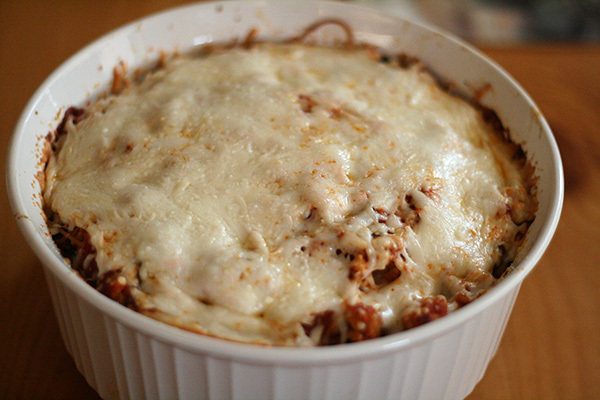 Spray a casserole dish, add half of the spaghetti mixture to the dish, then top with 1/2 cup tomato sauce, rest of basil, and half of each cheese. Add the remaining spaghetti and top with the rest of the sauce and cheese. Bake for 20 minutes or until the cheese is golden brown and bubbly. Makes 4 – 6 servings. This was my first time trying Mimic Creme, and I loved it. This was delicious, creamy, all things good. The chocolate chunks were the bonus! 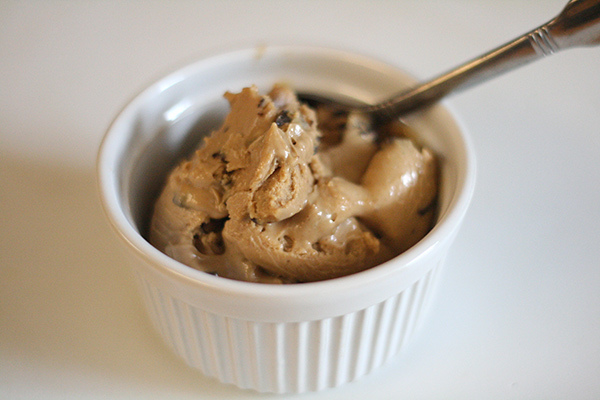 Easy peanut butter ice cream (nondairy) from Couldn’t Be Parve, with my big thanks! Combine mimic creme, one cup peanut butter, and vanilla in the blender. Blend to combine. Chill mixture. While mixture is chilling, make the peanut butter candy. Line a small cookie sheet with parchment or waxed paper. Combine the peanut butter and powdered sugar and stir well to combine. (it may seem that there’s too much powdered sugar, but keep on stirring). Knead the mixture until smooth. Press the mixture onto the prepared cookie sheet and flatten to 1/3″ thick. Melt the chocolate in the microwave on low power. Spread half of the chocolate over the peanut butter mixture. Place the cookie sheet in the freezer for 10 minutes, or until the chocolate is set. Flip the candy over and spread the remaining chocolate on the other side. Freeze for 10 minutes, or until set. Remove the candy from the freezer and chop into small pieces. Store in an airtight container in the freezer until ready to use. Freeze the ice cream mixture in an ice cream maker according to manufacturer’s instructions. Transfer to an airtight container and fold in the candy. Freeze until firm, at least several hours. For best texture remove it from the freezer and leave it at room temperature for 15 minutes before serving. Inspired by this recipe, I realized that I was out of pearl barley, which was the grain called for. I subbed faro for it instead, and the results were excellent. Put rack in middle of oven and preheat to 425 degrees F.
Toss eggplant, tomatoes, and bell pepper with 2 tablespoons oil and 1/2 teaspoon salt on a large rimmed baking sheet. Roast veggies until eggplant is golden brown and tender and tomatoes are shriveled, stirring halfway through, about 25 minutes. Heat 2 tablespoons oil in a 3 – 4 quart heavy pot over moderately high heat. Add the onion and cook til softened. Add the cumin, coriander, cayenne, and 1/2 teaspoon salt, stirring until fragrant, about 1 minute. Add faro and cook, stirring until well coated with oil for 1 minute more. Add water and bring to a boil. Reduce heat and simmer, covered, until all of the liquid is absorbed and faro is tender, 30 – 40 minutes. Remove from heat and let stand, covered, for about 5 minutes. 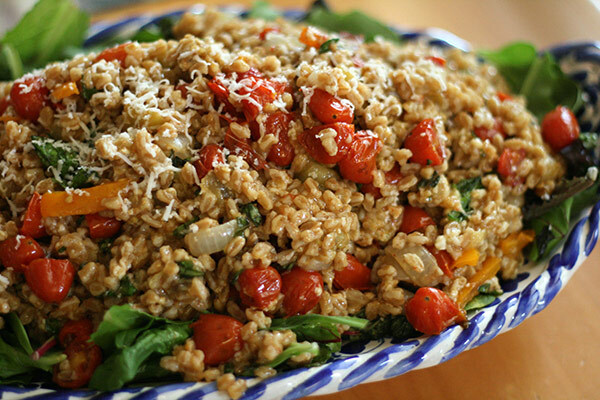 Transfer barley to baking pan with roasted vegetables and spread to cool, about 20 minutes. Whisk together lemon juice, garlic, honey, remaining 1/2 teaspoon salt, and oil. Pour over the faro and veggies, along with the basil and cheese. Mix together, and transfer to a serving bowl or platter. 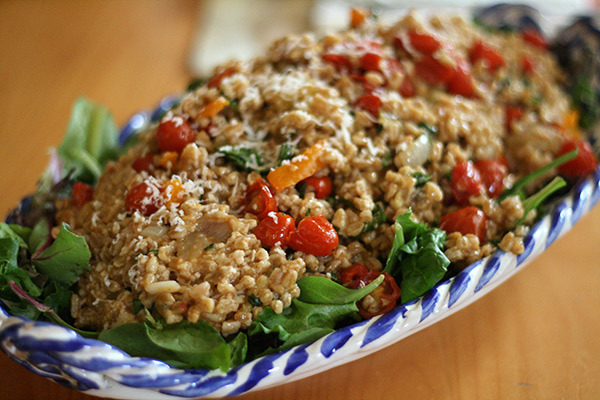 (Arrange some arugula or spinach leaves on the platter before piling on the faro mixture). Makes 6 servings. Delicate and delicious. A light summery pasta. Chop asparagus spears into 1″ pieces. Steam or boil for about 5 minutes or until tender. Bring a large pot of water to a boil and add several tablespoons of salt. Add the noodles and cook til al dente while preparing sauce. Do not allow noodles to cool since their heat is needed to cook the egg sauce. While noodles are cooking, heat oil and saute bacon pieces until crisp. 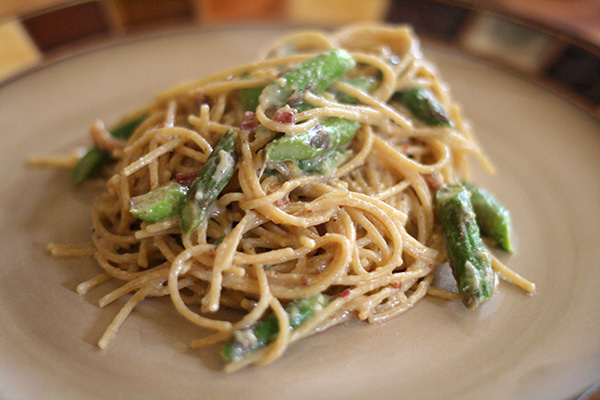 Add drained asparagus spears and garlic and cook until soft, while noodles finish. Whisk together the eggs, cheese, and 1/4 cup water from your pasta pot while stirring constantly to temper (warm up) the eggs without cooking them. Add hot noodles to hot skillet and coat in bacon fat. Stirring quickly to coat, add egg mixture to hot noodles. The eggs and cheese will thin and create a velvety sauce that coats the noodles. Stir in more pasta wataer if you want it saucier. Add fresh ground black pepper to taste and serve fresh and hot. Makes 4 – 6 servings.